Clayton Dodds submitted this photo and caption. This is me (Glassmen '07, '08, '09) and Ryan Lovell (Glassmen '07, '08, '09, '10) at the Women's Final Four in San Antonio this past weekend. We supported our basketball teams this past Sunday by playing in the pep bands – me in the University of Oklahoma "Sooner Showmen" and Ryan in the Baylor University "Courtside Players." We were bus seat partners during our rookie year at Glassmen and we've been best friends ever since. It was awesome to be reunited in San Antonio and to spend some time on the all-too-familiar River Walk, where every summer we spend a free day after the DCI Southwestern Championship in the Alamodome. It was awesome supporting our teams, playing a floating pep rally down the San Antonio River and reminiscing about our awesome drum corps experiences! 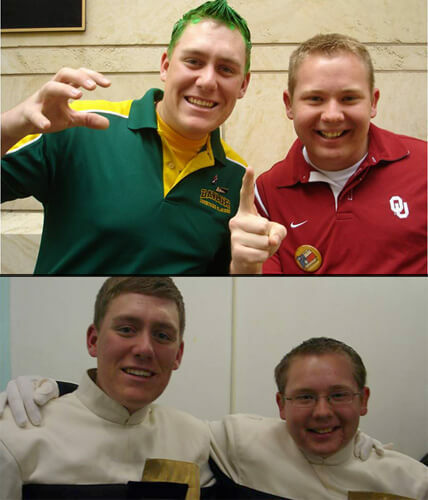 Sic' em Bears and Boomer Sooner!